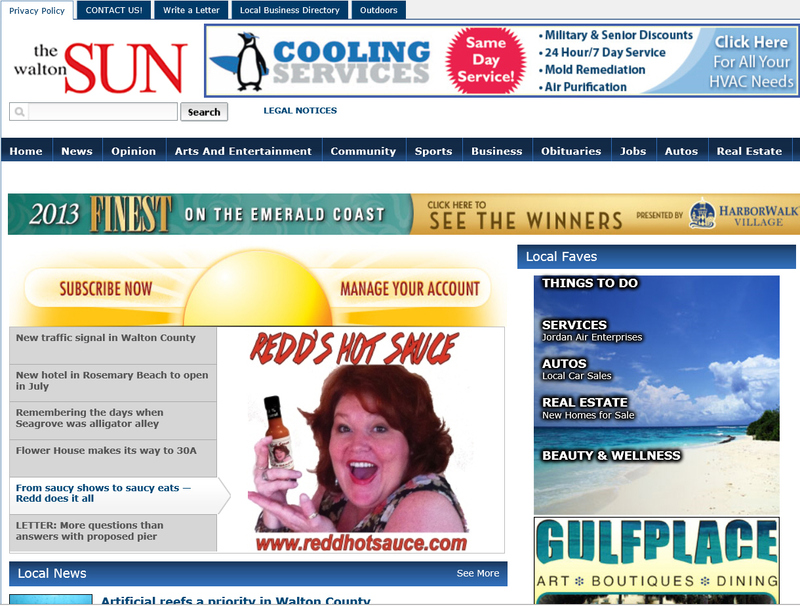 Redd Vizard has been a singing and performing sensation on 30A for a decade. Starting as a singing bartender at the former Sally's Backside, the songstress has branched out over the years to various other locations up and down the coast with her spicy hot and saucy performances. The song bird is now branching out even further with the debut of her own line of hot sauce. 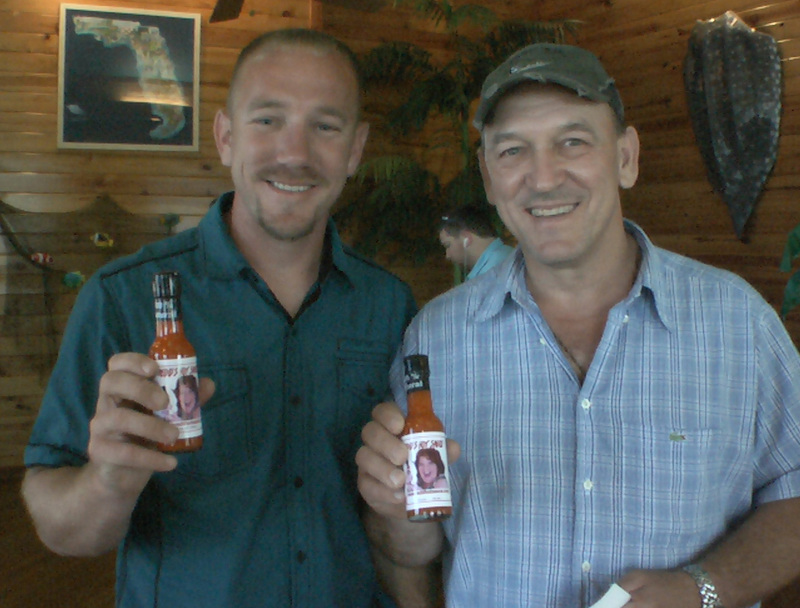 Redd's Hot & Saucy sauce made its debut in January and the first case sold out within a week. "We have been talking about it for a couple of years and just decided to do it," said Redd. The inspiration for the name came when someone posted on her Facebook page that "Redd is hot and saucy." Redd's husband, Paul, suggested a hot sauce to match Redd's performance, and after many recipe tests, the formula was finalized. Made from a base of carrot juice, mixed peppers (a secret combination) and key lime juice (a Key West connection), the mixture is 100-percent natural and contains no preservatives or vinegar. Although this is Redd's first foray into food distribution, she said she has always enjoyed experimenting in the kitchen. "Such as, I always eat guacamole and doctor it and make it my own. And the creation of this sauce goes with the way I cook. When I make salsa, I put jalapeños in it. 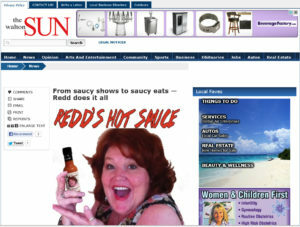 So, when we saw that post on Facebook, we thought that marketing our own sauce would be a fun thing as I'm not your average entertainer," said Redd, who admits she enjoys keeping them guessing. 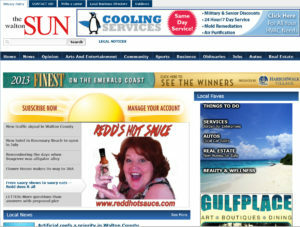 Redd's Hot & Saucy is basically a hot sauce and very versatile, she said, and can be used for items such as oysters. "It's made with total natural ingredients," said Redd. "Key lime makes it tangy, but not vinegary. I even use it on salad. A dash makes it bright, but not overwhelming." Redd said even though the sauce was just recently christened, she has been making and working on it for a couple of years, and plans are already cooking for a sweet sauce, a spicy version and a chunky variety. Redd's Hot & Saucy is available from her and wherever she performs: Marie's Bistro in Blue Mountain Beach, Sally's By The Sea Store - Enzo's, and Nick's on the Beach for $7.99. The Vizards moved to Santa Rosa Beach in 2007 from Key West, where she performed as a singing bartender at Aqua nightclub. She recreated the singing bartender role in 2008 at Sally's Backside in Blue Mountain Beach when it opened. Redd also has taken her saucy performances that include a cabaret style, up and down the coast. "I am surprised and overwhelmed by the positive support for the sauce," said Redd. "I sold out the first batch in a few days, and hope to get as many of the local restaurants and retailers to carry it too. I also have quite a few free recipes at www.reddshotsauce.com and will keep adding more." Redds Hot Sauce has a kick but it's not so overwhelming. I like the subtle tang which goes great with my favorite deviled eggs !